Online Shopping in Dubai: Treat yourself with this classy handbag this Women's Day! Shop now. Hurry up! Few days left for the offer! 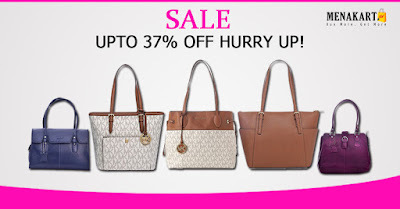 Treat yourself with this classy handbag this Women's Day! Shop now. Hurry up! Few days left for the offer! Keep your look classic and sophisticated with this stylish pouch wallet by Michael Kors. Constructed with the finest material and meticulous craftsmanship, this ultra-fashionable bag helps keep you organized while you look your best. This travel pouch is the most stylish way to bring your beauty essentials along for the ride. A mainstay in your getaway arsenal, it’s be decked in our tone-on-tone logo print. Toss it into any carry-on and you’ll be set from take off to touchdown.